“This is a wonderful facility run by Dr. Mango and his staff. If you are suffering from any kind of dizziness, vertigo, or balance disorders, then this is the place to be! I came here with a family member who has been debilitated and suffering with severe vertigo problems. After hearing about Mr. Cuban and his story, and reaching out to him by email, we were pleasantly surprised Mr. Cuban emailed back in 24 hrs. He highly recommended this facility, because he himself suffered from severe vertigo and came here. 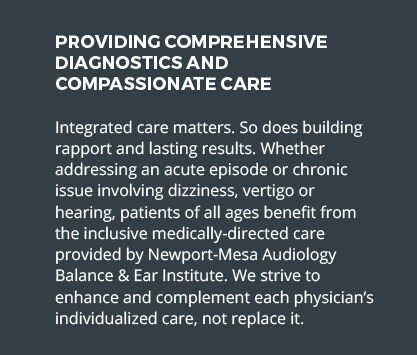 The Newport-Mesa Audiology Balance & Ear Institute and its team are amazing! 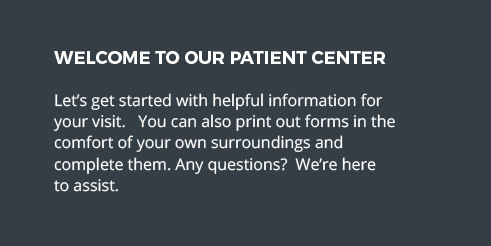 The caring and professionalism that each staff member showed along with lengthy discussions and explanations with complete privacy made us feel that they cared and were eager to find the proper diagnosis to get to the root of the problem(s), we weren’t just a number. We spent a total of a week coming here. My family member had a bunch of high tech state of the art testing done, and started some treatment before we left, that will continue at home. There are weekly Skype follow ups if you’re out of state and tweaking done if necessary throughout the entire treatment. The treatments vary from person to person and are individually personalized according to the test results. No two treatments are exactly alike because everyone who suffers is different to responding. This place has some of the most advanced equipment out there for vertigo. 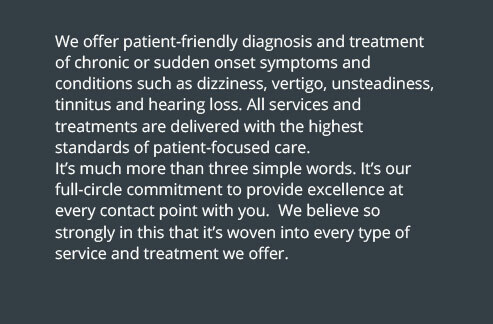 They specialize in benign paroxysmal positional vertigo (BPPV), migraine-associated vertigo, neuritis, vestibulopathy, Meniere’s disease, Mal de Debarquement Syndrome (MdDS) are just a few to mention. What I really liked was that I could attend all appointments and take notes and ask questions, not like in Boston where I wasn’t able to even come in to the room and give support or help to my loved one. NMABEI actually encourages family members to attend and support their family. 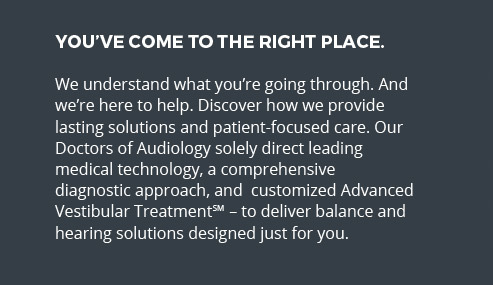 The staff at Newport Mesa-Audiology Balance and Ear Institute, especially Dr. Mango, Kristine, along with Dr Pearce, and their step-by-step explanations about the different treatments, made it easier to decide on a possible course of action. “I’m ecstatic that the Institute was able to diagnose and treat something that has been plaguing me for years. No one knew what was going on beyond benign vertigo. I’m so happy to find this “balance” in my life. Thank you so very much! Everyone was great at reception which really means a lot to patients. They were kind, courteous, accommodating, quick and efficient. Thank you for the patience, interest and attending care you and your colleagues have faithfully provided me! I have improved so much since I first began your program. I am more sure of myself, more calm and have obtained information and exercises I did not have before. As to how much improvement I have made in my walking – maybe 50 – 70%. I have noticed that my diet, rest vs. fatigue, shoes I wear might be contributing factors also! “I wanted to let you know just how incredibly amazing you and your staff have been from the very beginning. On March 21 of last year, I woke up in a completely different world. I was absolutely terrified and depressed for what seemed like an eternity. You and your staff helped me to feel right at home from the second I stepped into your building. I felt comforted as if I was surrounded by the best of the best. I will never forget the feeling I had walking out of your facility to begin the drive home and the sense of relief I had that finally, someone had found what was wrong with me.